On the plus side, jams no longer apply as your traffic-busting bike sails easily past hundreds of stopped or slow-moving cars on congested roads and freeways. You get where you want to go quickly and easily, with minimal gas/petrol costs. On the other side of the coin, lane-splitting is the thing I see performed with more lunacy than any other aspect of riding and it is easily the source of the most accidents. As a Waze Traffic Alert flashes up on my phone telling me accidents and heavy traffic are contributing to an estimated 2-hour car ride home, I swipe it away knowing full well I’ll be home in less than 50 minutes. But I also swipe it away knowing the crazy traffic conditions I am about to encounter during rush-hour on one of LA’s busiest freeways, and I am mindful that I have a responsibility as a husband and father to make it home to my family in one piece each day… This article will explain all the lane-splitting techniques and knowledge I’ve garnered over 15 years of commuting in and out of London and LA, on some of the most congested roads in the world, in the worst weather conditions possible. If traffic is either stopped or dead slow (freeway) – your speed through it should be between 20 and 30mph and no more than this. On regular roads, where you have junctions on both sides, people crossing etc – this should be even lower. As the speed of traffic around you increases, you can raise this limit from 30mph to 40mph. Once traffic is travelling above 40mph, you should stop filtering and resume the normal road-riding position in the center of your lane. You really don’t need – and shouldn’t want – to split lanes at speeds in excess of 40mph. It’s dangerous enough without the high speed adding to it. 30mph may seem slow – but think about this for a second. Even at that speed, you are still traveling at 30mph faster than any other car around you. Which means you are already going to get to your destination far quicker than they are. And what’s the big hurry anyway? I don’t know about you, but I’m really not that desperate to get to work 5 minutes earlier… And whilst I am grateful for my well-paying desk job, it is certainly not something that I would ever risk life and limb for. You have a long journey home through congested roads. Time is short. You’re tired and have had a bad day. The temptation is to fight the traffic and blast through it – but you’re asking for trouble here. You are tired, which dulls your reflexes and judgement; you’re emotive meaning you take risks; and you’re riding faster trying to catch the clock. Take a breath. Forget the clock. Don’t fight heavy traffic on a bike. You’ll lose. Realize you can’t fight it and instead go with it. Ride slower, take your time, relax and adopt a “you’ll see when when you see me” approach. Show respect and pick your way through carefully. You’ll make good progress and won’t be increasing your accident chances in the process. A bad night’s sleep and a long day at work can really affect your alertness. Learn to recognize how tired you are and adjust your riding accordingly. Especially if you are going to be splitting lanes and filtering through rush-hour traffic. I know I am far more alert on my morning ride to work than I am on my evening ride home after a long day at work. Consequently, my speed through traffic is lower in the evening than it is in the morning. Not by much – but enough to give my slower reactions time to kick in. Lane splitting is dangerous. Period. In heavy traffic, you have no escape route and therefore are totally relying on your reactions and brakes when some idiot changes lanes on you. If the worst happens and you are collected my our lane-changing, blind friend in their SUV, you want to make sure that when you hit their car/the deck/something else that you’ve got as much protection on as possible. Here is SoCal – I know it’s hot. But it’s no less dangerous just because the sun is shining. Think about what you want to be wearing WHEN (not if) you have an accident. There’s plenty of excellent, low-cost, hi-viz motorcycle gear offering excellent protection. Invest in some. It will save you a lot of pain and may save your life. If you put yourself in a situation where there is nothing you can do to avoid an accident then you are riding out of control. Period. Advanced riding – and safe lane-splitting – means control is ALWAYS with you – the rider, 100% of the time. All the time you are in 100% control – you dictate what is going to happen to you. Start handing that control over to someone else, and your chances of safe passage without incident rapidly diminish. Slow down. Don’t take silly risks. Filter safely. Ride in control. A big part of successful lane-splitting is being able to spot your enemy before they can hurt you. Over time, you’ll get really good at this, with any number of familiar indicators sounding off your internal alarm bell, but I’ll mention a few here. Firstly, when filtering through heavy traffic, look at the wheels and tires. They are the first thing that will move prior to a lane switch so is the first thing you should be on red alert for. Secondly, look for the usual crowd on their mobile phones, head movements, mirror checks (or lack of them), mirrors themselves (glass missing or missing entirely) and indicating. Yes – some people may indicate when illegally crossing the quadruple solid yellow lines between their lane and the car pool! Does that mean they’ve seen you? Absolutely not. Use their flashing light as an indication to slow down and treat with extreme caution as they’ve basically signaled their intent to pull out without straight in front of you. I’ve had a woman indicate, check her wing mirror and still pull out straight in front of me on the 405. You brake and then honk – the slow, dumb expression of realization is always the same… On the highway, is one lane of traffic slowing down while the one next to it continues to flow freely? If so, expect drivers to cheekily nip across from the slowing lane into the one where traffic is still flowing. In stopped traffic, has one lane started move before another? Again, expect drivers to shift into lanes with higher speeds. Even if they do glance at their mirrors before they attempt to nip across, they will NOT be on the lookout for a motorcycle! The four most important words spoken to me by my instructor 16 years ago. I’ll leave it at that. As well as being the only state that permits lane-splitting, another great advantage of Cali driving laws is that motorcycles are allowed in the car pool lane. Despite the lunacy of most California rider education, requirements and laws (see other posts) this one is actually a good one. The car pool lane is not only lighter traffic, it’s also protected with double, sometimes quadruple solid yellow lines so is a great place to ride in. The majority of your lane-splitting on freeways will be done here – between the car pool and the outside lane of the freeway. You are only allowed to enter or exit the carpool lane at designated points where the solid yellow lines give way to dotted white ones. Don’t think the solid yellow lines protect you or the fact that cutting over them is illegal which deters people from doing it. I see drivers cutting over solid double or quadruple yellow lines every day. Because it’s illegal and they know they shouldn’t do it – most of them don’t indicate their intentions by putting on their turn signal; they’ll just nip across as quickly as possible with no warning. This is what you want to be on the lookout for the most while riding in the carpool. When you are lane-splitting, be very aware that any vehicle can pull out and into you at any time. So ride accordingly. Ride at a speed that when (not if) it happens, you can slow or stop the bike in time to avoid hitting anything. On the freeway, that means 20-30mph MAX. You simply cannot stop the bike in time if you are doing in excess of this. Be especially vigilant at car pool entry / exit points. This is where cars can legally move in and out of the car pool lane, so expect extra vehicular activity here and be prepared that none of it has seen you! Also be on the lookout for cars that travel the entire length of the car pool entry area only to nip across right as it comes to an end. It’s stupid, it doesn’t make sense, but I’ve seen it so many times I’ve given up counting. Constantly monitor traffic behavior in the other lanes. Be especially on the lookout for traffic up ahead slowing down drastically or stopping as that’s the most likely time someone will nip out of that lane, especially if they’ve not been paying attention and missed their braking. This is bad enough if you are not filtering, but is infinitely more dangerous to you if you are. If town or city riding, be especially vigilant of other hazards, not only in relation to you, but in relation to traffic in lanes next to you. Pay special attention to junctions, traffic lights, pedestrians and parked cars. Give yourself extra time and space if lane-splitting at night and / or in the wet. No matter when and where you split lanes (freeway or regular public roads and streets), get into the habit of covering the controls so you can react quicker. Why? Cutting through heavy traffic on either side of you means you have zero (or very limited) escape routes if something happens in front of you. You can’t swerve into another lane because all lanes are full of traffic. There is no room to maneuver around something for the same reason. The only option you usually have when lane-splitting is to apply the brakes. So get into the habit, when you split lanes, of covering the front and rear brakes with your right hand and foot. Cover the clutch with your left hand. And while you’re doing that, think about making that emergency stop. You’ll make a much better stop if you are thinking about your braking action and have the controls already covered than if you are daydreaming and have to grab the brakes in surprise when some idiot pulls out on you. Be especially aware of vehicles in relation to other cars, as well as in relation to you. By that I mean it’s safer to filter between two cars that are next to each other than two cars where one is ahead of the other. If a car has no way to shift lanes, it probably won’t. Learn to spot gaps and situations that can suddenly be filled by a car. Learn to spot potential hazards or situations before they become one. That means you’ll ride more defensively, but when it happens, you won’t be caught by surprise, so will be more prepared to react. Don’t hang around when lane-splitting. Be decisive and move past cars efficiently and authoritatively. If you need to slow, that’s fine, but drop back to maintain a safe cushion or move into a lane and assume the dominant riding position. Never ride next to a car – either on the freeway or on town streets. They will inevitably change lanes into you. Obviously your forward vision and anticipation are crucial to safely and successfully lane-split, but also make time for what’s coming up behind you, especially on freeways where most of the lane-splitting is done between the carpool and outside lane. Don’t spend ages looking in your rear-view mirrors. All the time you’re looking behind means you are not looking forwards so keep it to a short glance every now and then. If you notice someone on your tail, under no circumstances speed up and attempt to lane-split at their (often dangerous pace). Relax and look for a gap you can safely pull into thus letting them by. Always use your turn signals here to let the rider behind know you are slowing down and are pulling over for them. If you come up behind slower riders, take a chill pill. They will be concentrating just as hard as you and may not have noticed you come up behind them. Either wait for them to pull over or if its not looking likely, move into another lane and go around. Getting pissed off at another rider in congested traffic just isn’t worth the shift in focus. Drivers that see you coming and pull over out of your way / give you more room. Always give these people a quick thumbs up / thank you gesture with your hand. They’ve given you safer passage in a very tight, congested space and made the effort to move over. Drivers that may or may not have see you coming but do nothing as you approach. These guys are great as they are very predictable. They sit in their lane and aren’t going to try anything suddenly that takes you by surprise. Drivers that see you and try and squeeze you. Yup – it happens. These guys are just anti-bike, anti-rider and are seething with resentment at having to sit in traffic while bikes effortlessly sail past them. They’ll either move over and squeeze you as you approach, or will just sit to the right of the carpool lane giving you no room to get by. Don’t get angry at these people. Don’t kick their car or bang their side mirror. Realize they exist, be prepared for them and deal with them professionally and safely when you encounter them. This is never more important than when filtering in traffic. Ride smoothly. Keep your focus on the situations around you – not on operating the motorcycle. Ride at a constant speed wherever possible. A steady pace through heavy traffic means you will be more relaxed and far less frantic at the controls. 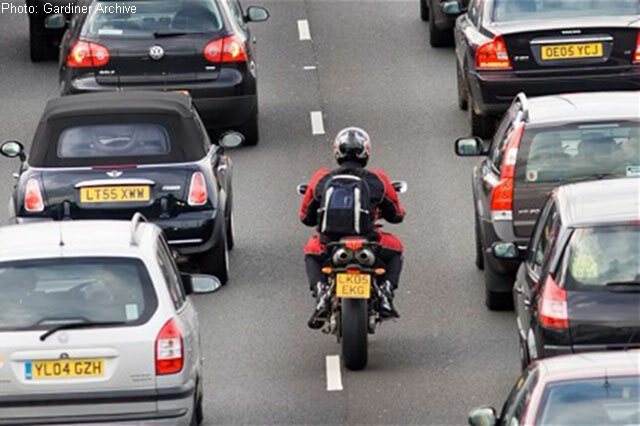 Whilst this article gives a lot of tips and tricks garnered over years of lane-splitting through the worst of London and LA traffic, there’s no substitute for getting out there and practicing. You’ll develop your own techniques and rules that you’ll be comfortable with, and your own sixth sense which comes from experience. I hope you found something here that was useful and employ some of the tips mentioned. It’s not the be all and end all – so if you have any tips or suggestions for safe lane-splitting, please share in the comments. This entry was posted in Road Riding and tagged filtering, lane split, lane splitting, split lanes on March 2, 2016 by mc_admin.